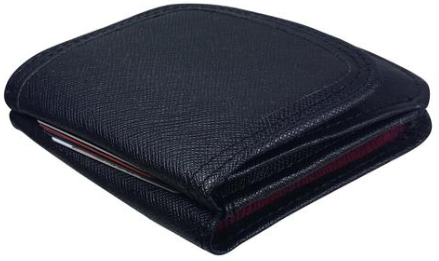 Wallets are an ubiquitous every day carry item and are in the pocket of the large majority of men, vegan or not alike. However, few are the ethical men who research and buy vegan leather wallets, and we commend thee. 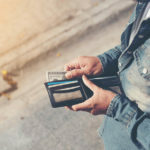 We have found the best of the best and wanted to share with you the top vegan wallets for men of 2019. Without further ado, check these bad boys out. Disclaimer: Most of the links to the wallets are affiliated, meaning that I get a percentage of any purchase you make on Amazon, with no extra cost to you whatsoever. This allows me to sustain this website, and to keep posting reviews and guides for vegan men and women. This slim wallet design is fashion forward while being the perfect minimalist every day carry. It’s a classic bifold wallet with 3 card slots, one ID card, two secret pockets, and two bill compartments. 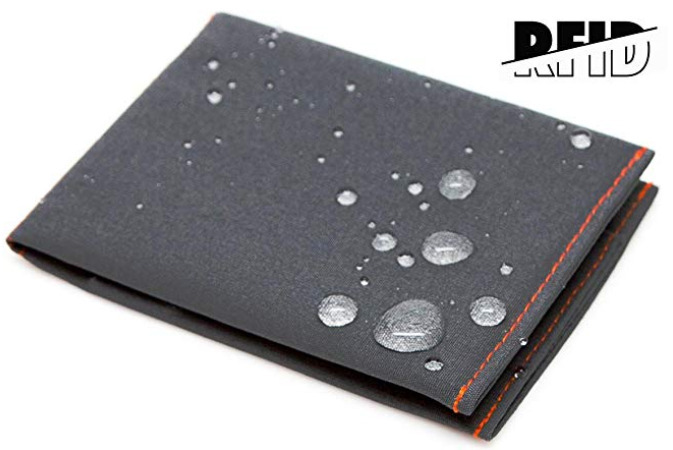 Made from 100% manmade material, this lightweight vegan wallet for men is waterproof, easy to clean and extremely resistant to wear and tear. If you buy this on Amazon, it comes in a fancier box that you can gift directly to your boyfriend, husband, dad or son for any special occasion. It’s the best gift a vegan man can get. You get a full refund under 30 days if you don’t like it! 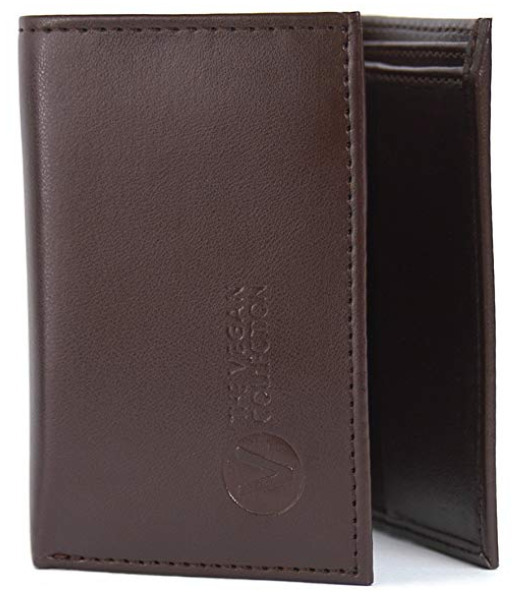 Made from high quality vegan faux leather, this men’s wallet is pleasant to the touch, durable and perfectly elegant for every day use. This bifold has six card slots, two slip pockets, two cash compartments and an ID window. It also has RFID and is guaranteed to protect your data and identity from being stolen. Comes with a 1-year warranty! 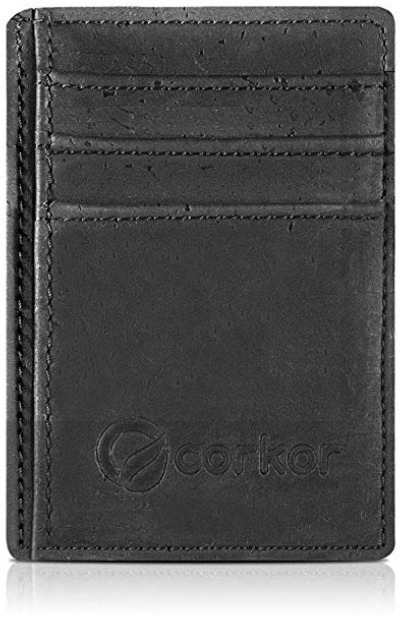 Made from genuine cork, this wallet from Corkor is one of their classic model. With a slim design, you won’t believe that this vegan wallet can hold up to 10 cards. On top of that, it also has RFID blocking and is Peta Vegan approved! 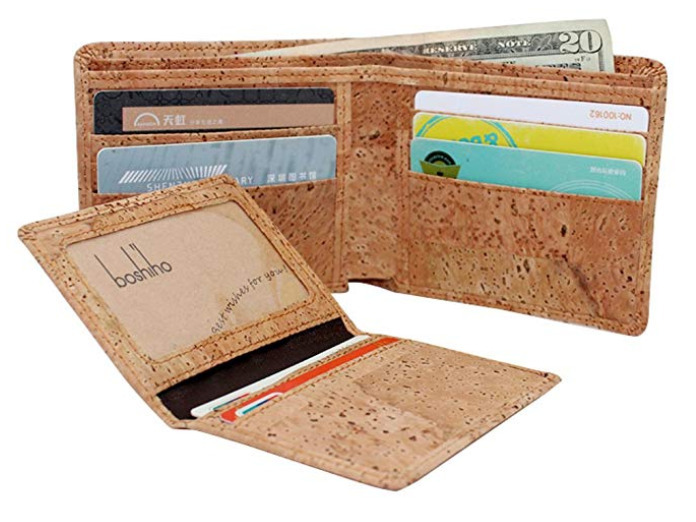 This eco-friendly wallet was made by artisans in Portugal. This wallet, once again from Corkor, has a unique design mimicking a Zebra’s skin without any cruelty needed. This 100% vegan wallet is the perfect companion on your ethical journeys around the world. 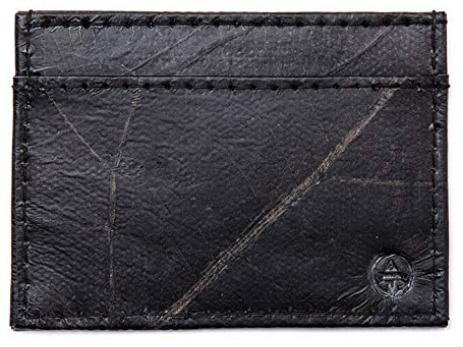 Tree Tribe’s wallets are made from leaf leather, a plant-based alternative to leather. Made from Teak leaves and a strong seal, they are very durable and are water resistant. All the products from Tree Tribe are handmade and unique, as they use 100% real leaves in every wallet. With their impressive dedication, they promise to plant 10 trees for every sale they make. It makes the perfect gift for a vegan man! 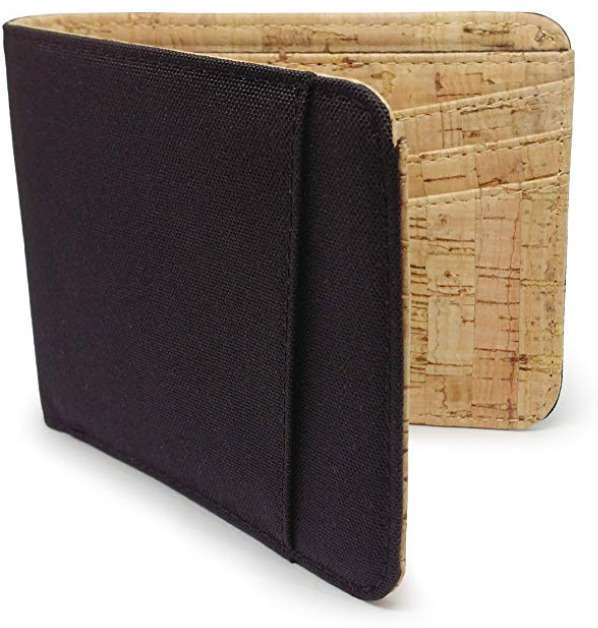 This slim wallet from kinzd is made from red wine cork leather. 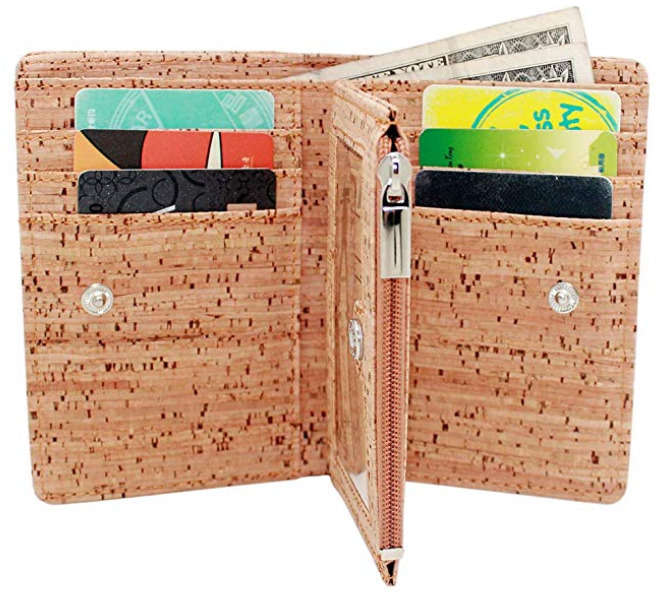 Think back to all of the wine bottles you’ve drank in your lifetime, and imagine you could make a wallet out of all the corks you’ve thrown out! 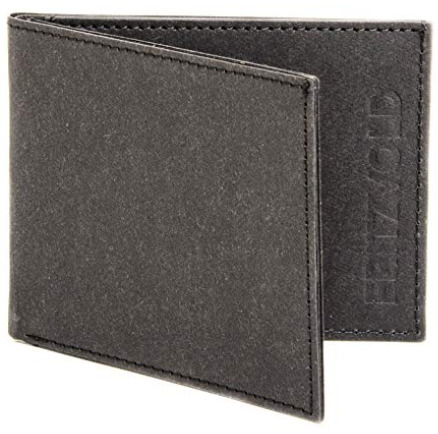 This is exactly what kinzd has set to do, and they’ve succeeded by offering us this classic minimalist wallet for vegan men. 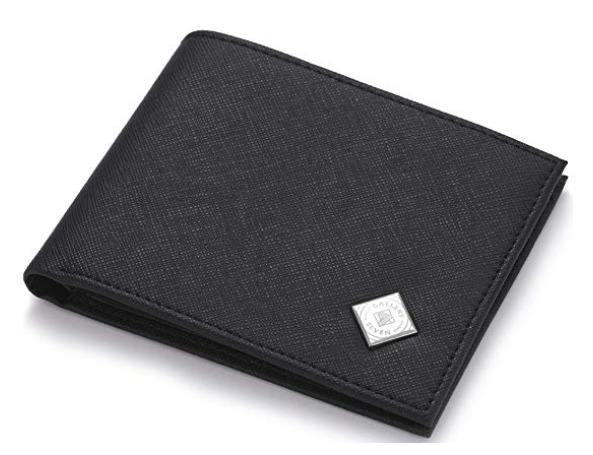 It is an RFID blocking wallet. You also have 12 months to like it, or you will have your money back guaranteed. Corkor is a brand with a lot of wallet models, and they all deserve a spot on this long list of wallets for vegan men. 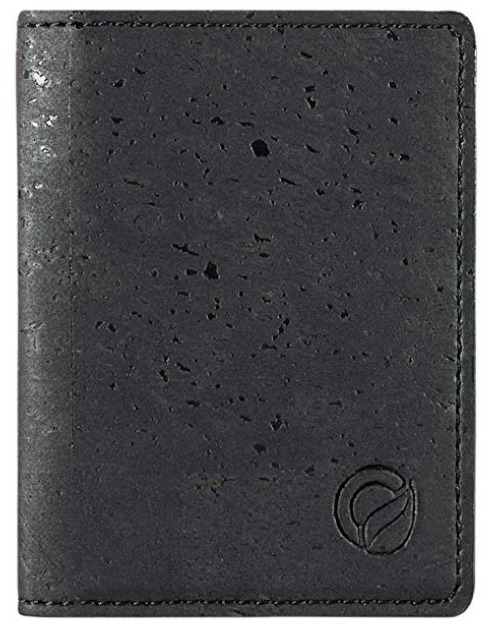 This one is RFID blocking, and is made from superior cork leather. So superior, in fact, that they give you a 2-year manufacturer warranty in case it’s defective! 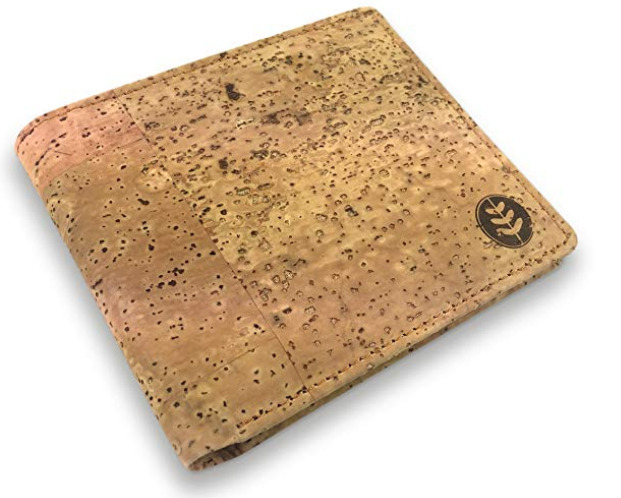 This wallet from Money Smart was made from natural cork, a sustainable alternative to animal leather. This is the perfect wallet to gift to your vegan and environmentally-conscious friends. They go to lenghts to make sure that their cork is sustainably harvested from trees. RFID protected, and uniquely designed, this water-resistant, anti-microbial wallet is also very pleasant to the touch. 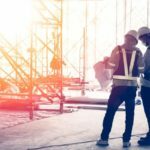 Corkor is everywhere in this list. This one’s an ultra light, minimalist vegan wallet with three card slots, one ID window and two bill compartments. Made from cork, has RFID, is sustainable, yadda yadda. You get the idea. Boshiho seems to be one of the big competitors to Corkor, and they have beautiful 100% cork designs on the market. This vegan wallet is light and has a very simple design. Six total card slots, and two bill compartments, it even has a small pouch for change and is RFID blocking capable. They’re quality and satisfaction guaranteed! From Kickstarter, Dash brings you this ultra-light synthetic canvas vegan leather wallet. The material they use is the same that is used in a bunch of luxury brands, so you know it’s legit. Extremely durable and light, it can hold up to eight cards while being minimal and aesthetic. Has a two year limited warranty. You thought we were done with Corkor wallets? Think again, we’ve got a few more to go. This one has a front pocket! It can fit up to ten cards in total, and has a very small profile, to the point where it probably won’t show on your front or back pocket. Peta vegan approved as always. The Vegan Collection is a personal favorite. 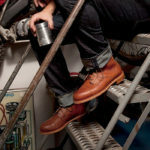 They do a bunch of accessories for men and women alike, such as vegan belts, bags and wallets. Made from faux leather, it is manufactured under ethical and fair trade practices in India. A simply beautiful wallet. This USA-made wallet from Slimfold is slim as heck. The RFID blocking wallet is roomy and can hold up to eight cards, while still being minimalistic and waterproof. 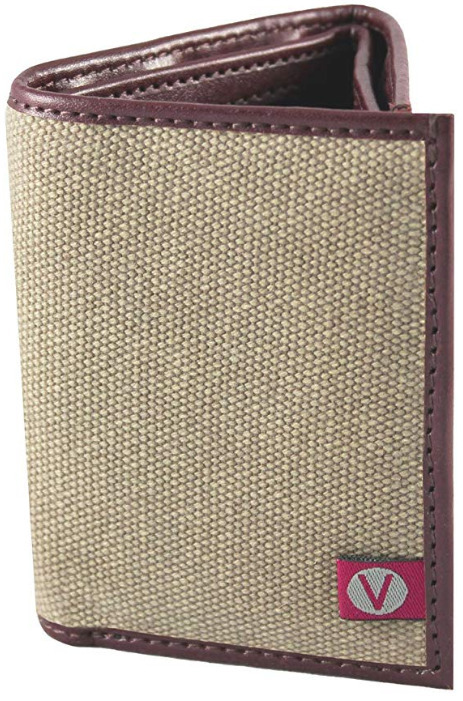 They offer a whole 5-year warranty, and stand strong and tall behind this men’s vegan wallet. 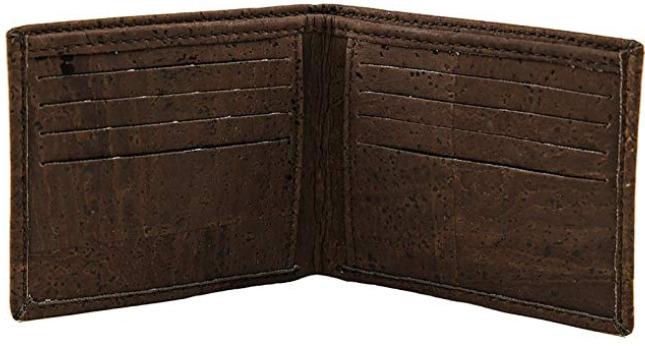 This is your typical men’s leather wallet, without the leather. 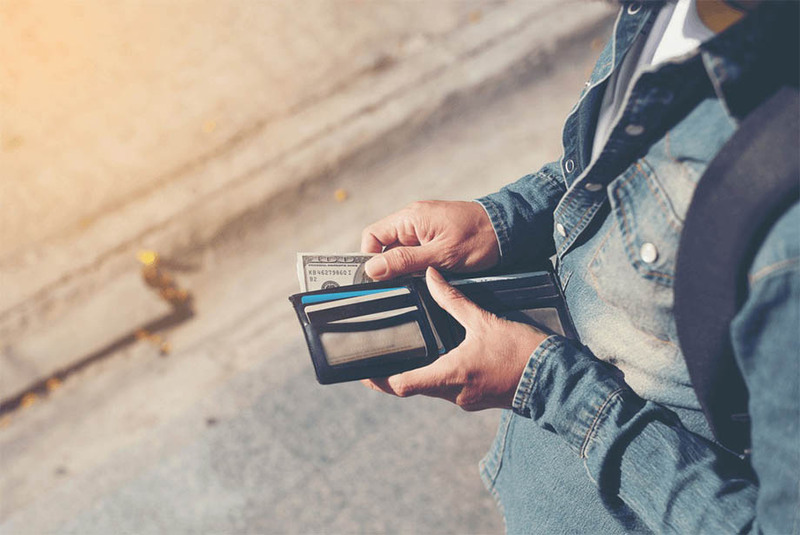 HISSIMO came out with this synthetic eco-friendly leather wallet that is also RFID blocking capable and has three cards and an ID window, as well as a cash pocket. Feel confident in this wallet’s security to keep you from any data-stealing crimes. It’s also covered by their 18-months warranty. Hemp is the material of the future. Growing hemp has been legal for a small time now (after being banned for nearly a century), and it has been one of the materials of choice for vegan wallets and clothing around the world. It’s durable and eco-friendly, and this wallet from Hempmania has eight compartments and has been manufactured in fair conditions. If you’re looking to personalize and customize a wallet as a gift for vegan friend, husband, or boyfriend, this faux leather wallet is the one for you. It has an engraved monogram of his initial with the name running through it. On top of that, it is slim and light and will fit in a wide range of pockets. It has six card slots and two pockets for bills. Great Valentine’s or Christmas gift for a vegan man. 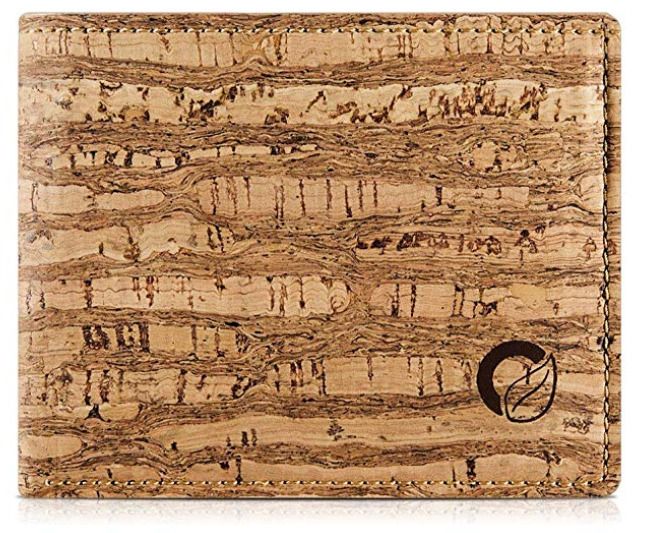 Cork is in vogue, as it is soft, flexible, resistant to wear and tear, and a sustainable material. 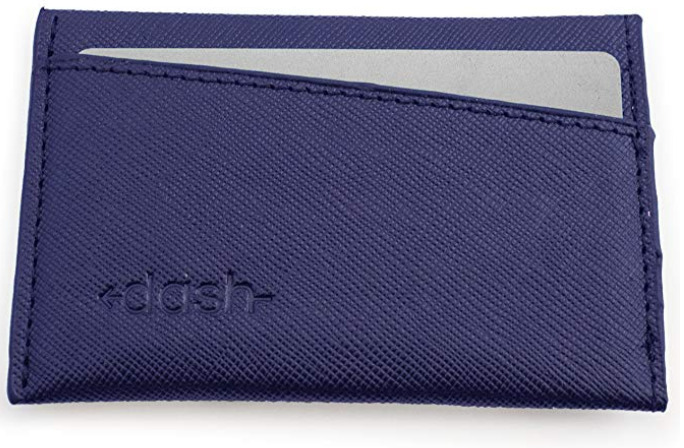 This vegan wallet from Boshiho with RFID blocking has two bill compartments, eight card slots, two ID windows and a zipper compartment. Check it out! 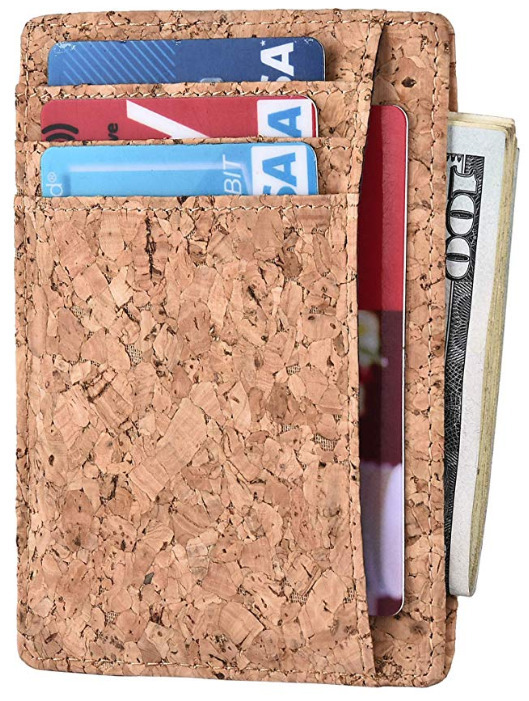 This completely vegan wallet made from 100% cork has RFID blocking capabilities, meaning that it will keep your data safe. Perfect gift for the ethical vegan or vegetarian man. Has an ID window with two card slots, seven separate card slots, two pockets and two hidden card slots. It comes with a gift box! 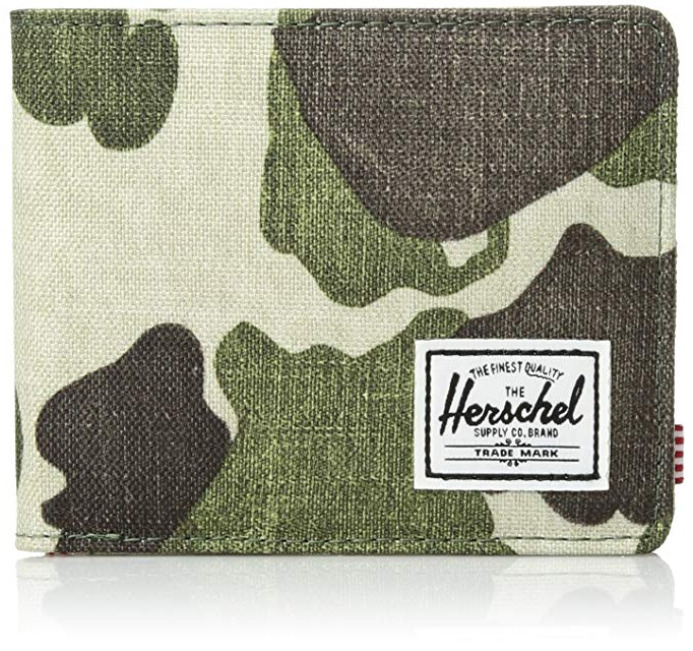 Hershel Supply Co. is known for their backpacks, but they also have vegan wallets. This one, made from 100% polyester in a frog camo design, is light and durable, and has multiple card slots and an RFID blocking layer. This classic bifold design has a large bill pocket, eight RFID protected card slots for maximum security against identitiy theft. It’s made from extremely durable nylon, and has a water-resistant coating. This wallet is an ethical, sustainable and effective alternative to leather wallets. 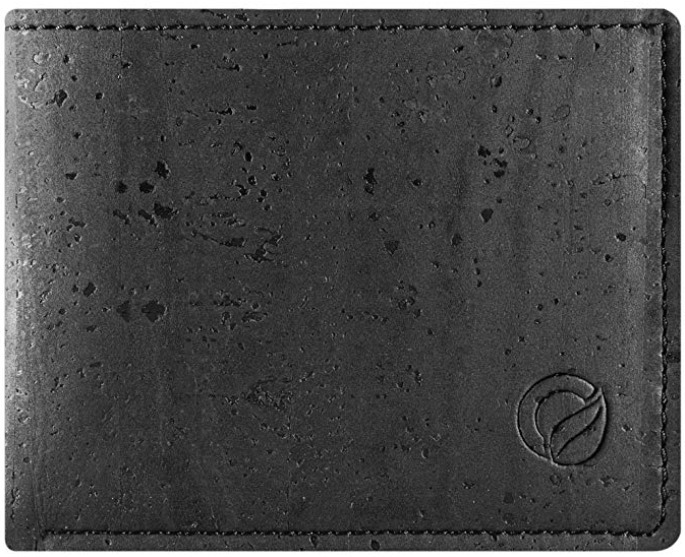 Here’s another design from Tree Tribe and their leaf leather wallets. 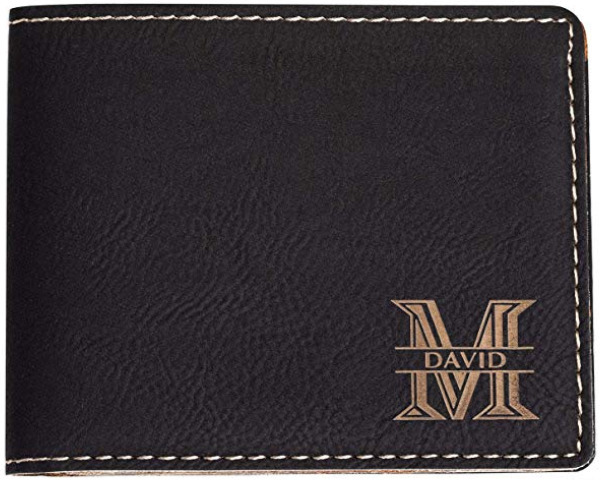 This one has the more classical black leather wallet look, without any animal cruelty. It’s a non-leather alternative made from Teak leaves covered in a strong durable water-resistant seal. Did I mention that they plant 10 trees for every sale? 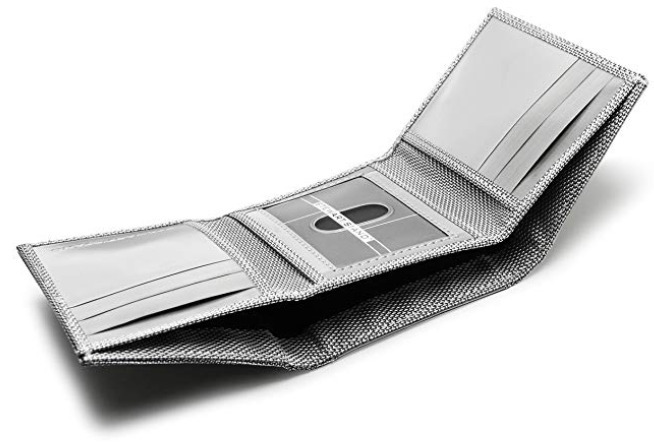 If you are looking for a metallic look, this wallet from Stewart/Stand is perfectly designed to be strong, flexible and unique. It has RFID blocking capabilities, and will keep your personal data safe. A perfect wallet for a gift for a vegan man. Six card slots, two pockets and one bill compartment, it has a 12-month defect and theft warranty. This wallet from Stewart/Stand is very similar to the previous one, but is tri-fold for this extra bit of versatility and usability. Has the same RFID blocking capabilities, slim profile and includes an ID window. It’s a wallet definitely built to last. This paper leather bifold wallet has been developed in Germany and is extremely slim and light. 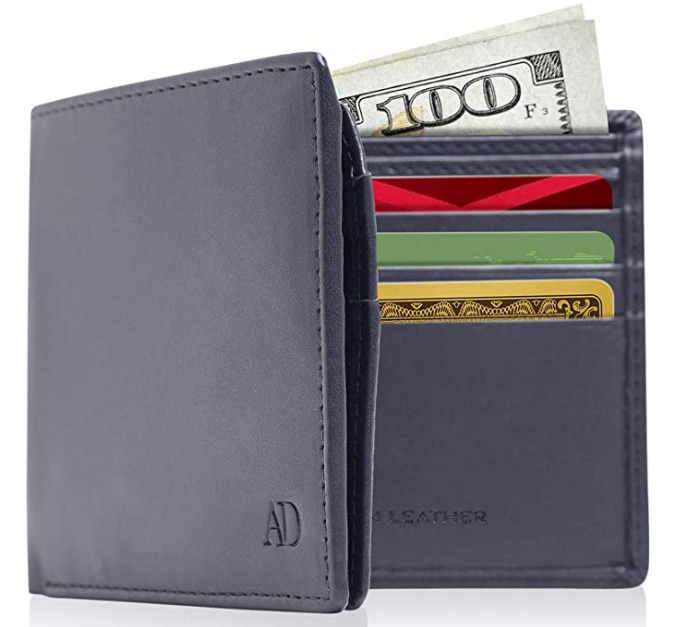 This doesn’t mean that it struggles to fit cards and money, as it can hold up to 10 cards in RFID-blocked slots and bills while being up to three times slimmer than the classic leather wallet for men. It’s also very resistant and can be hand-washed when needed. 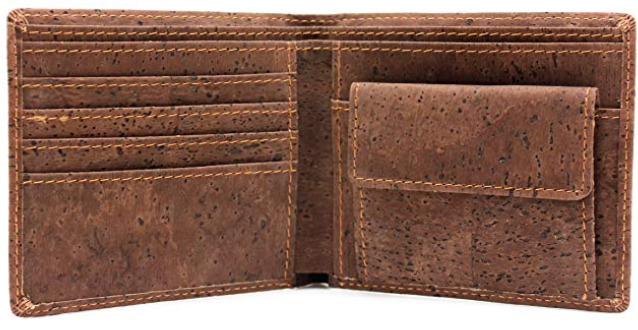 This wallet from Cork by Design is made from, you guessed it, cork. This handmade cork wallet is a deep dark brown color and weights almost nothing, while being able to fit up to 8 cards. 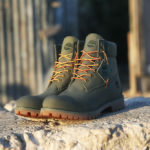 It’s water-repellant, Peta approved and sustainably built. 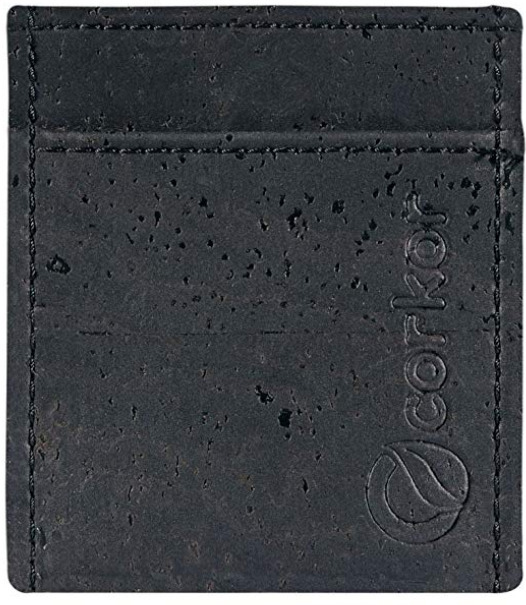 This is the last vegan wallet from Corkor on this list, I promise. 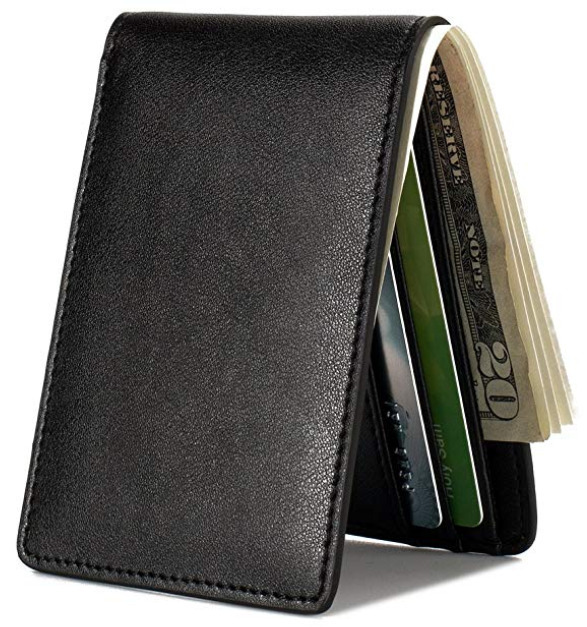 It has a classic bifold design with eight card slots and two compartments for bills and notes. 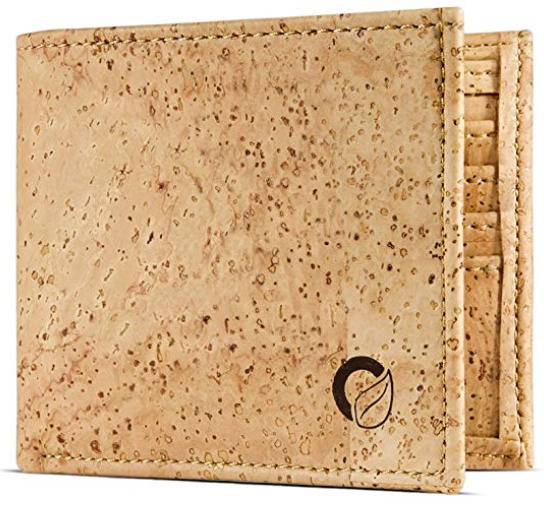 Handmade in Portugal, this slim and durable cork wallet is the perfect vegan alternative to a leather wallet. Get it today, and if you don’t like it, you can send it for a full money-back guarantee. 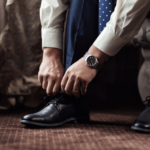 A classic design in a very classic brown color made from synthetic microfiber, mimicking the leather look with it’s faux leather material, even when it’s worn out. 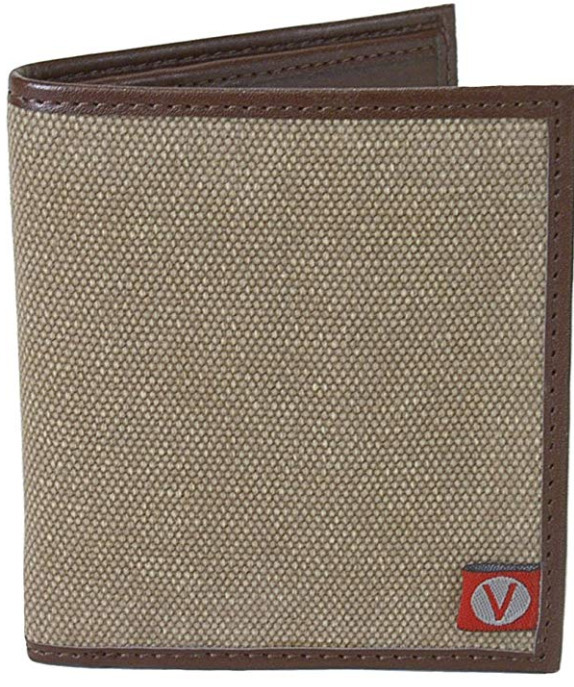 It’s the perfect wallet for the vegan man, and it has been manufactured in fair conditions in India. 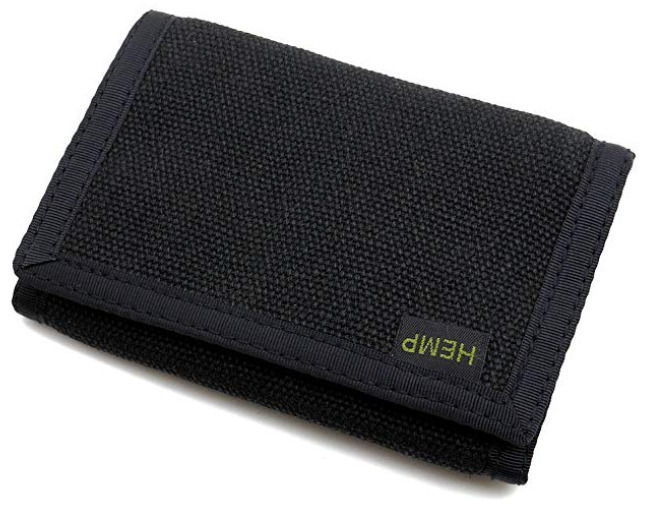 This hemp wallet from Hempy is a more casual take on men’s wallets. It is made in the USA and has 11 compartments for all your every day vegan needs. 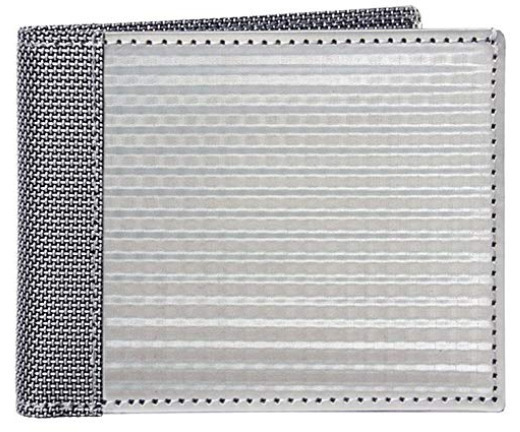 The quality stitches and construction of this wallet assures its durability and sturdiness. 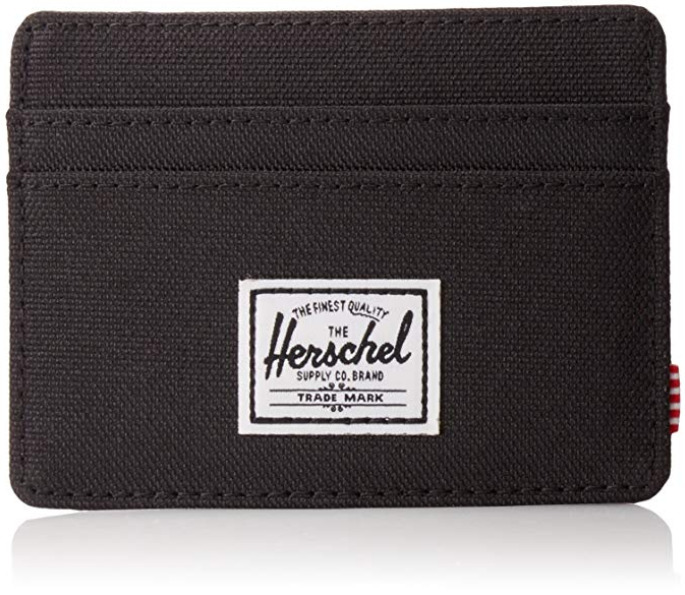 A very nice black wallet from Herschel Supply Co. made from polyester and textile lining. 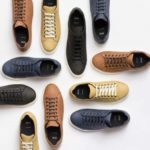 Has the well-known logo stitched at the bottom corner and the signature striped lining on the inside. 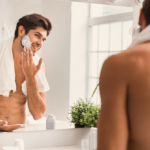 You can hand wash it and it’s an all-around great wallet for a vegan man. This faux leather wallet from The Vegan Collection has five card slots, two interior pockets, an ID window and a large bill pocket for your notes. With a very minimalist design, you can still flaunt your vegan-ness with the little V logo in the corner, so people know you’re legit. 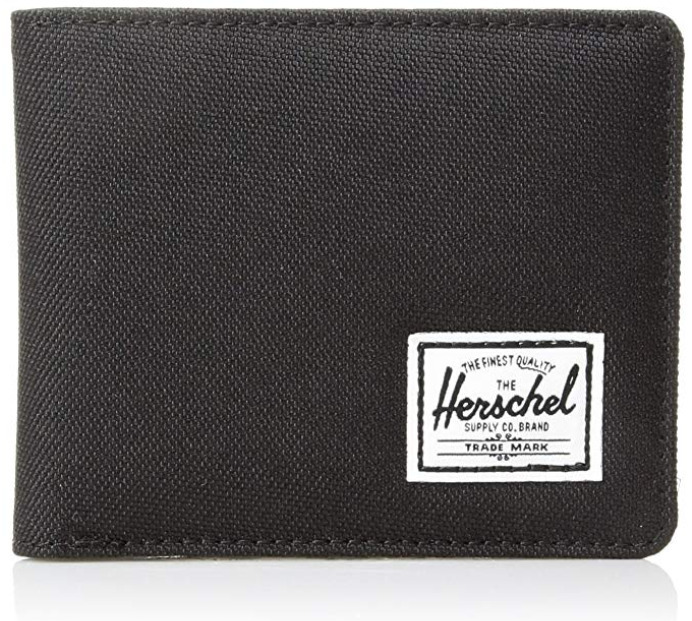 And the last, but not least, vegan wallet from Herschel Supply Co. Just like the last one, this wallet is made from 100% Polyester, has an RFID-blocking layer, and a top-access storage sleeve. Lastly, he logo is stitched right in the middle of it, and the interior is lined with the signature striped lining. The design of this wallet from Alicia Klein Taxi Wallet collection is quite interesting. Opening at the top, it has a compartment for coins and ID and credit cards for easy reach. When opened as a booklet, it gives you access to two bill compartments. With it’s curved corners, it also fits easily in a front pocket without awkwardly sticking out of your pants. On top of all that, it also RFID-protected!